Now you see it, and now you won’t. 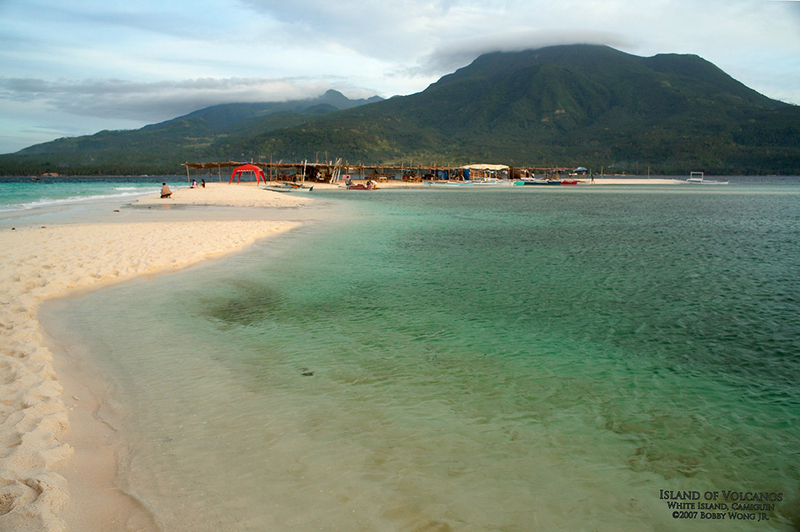 We were on a sand bar called White Island, off the coast of the town of Mambajao, on the volcanic island of Camiguin. Now we all know that the Philippines is composed of 7,107 islands, right? But would that be at high or low tide? No kidding. Quite a number do disappear when the tide is high, and if you count sand bars as islands, White Island would be one of them. We were told that during the typhoon season, the waves would over-run the island and the bamboo structures will be blown-out to sea, returning the strip of sand to its pristine state, until next summer comes around. An island that is refreshed with the tides, how’s that for a tourist attraction? Enjoy. That's the kind of a place you want a nasty, overbearing, self-important tourist to be staying in when the tide comes in LOL. Just kidding. "bamboo structures will be blown-out to sea"
I've been to Camiguin but it was in the 90's and there were no structures on the white island then. The set up of make shift huts is okay only if they DO NOT LITTER the area with their trash. I find it environmentally risky to the area. IF only the people will remember to clean up before they go then we can have this idyllic sandbar scene for many decades to come.